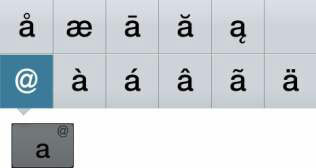 With your Samsung Galaxy tablet, you’re not limited to typing only the symbols you see on the alphabetic keyboard. The onscreen keyboard has many more symbols available, which you can see by touching the Sym key. Touching this key gives you access to two additional keyboard layouts. Touch the 1/2 or 2/2 key to switch between the symbol keyboards. Some of the symbols may not look the same on all tablets. 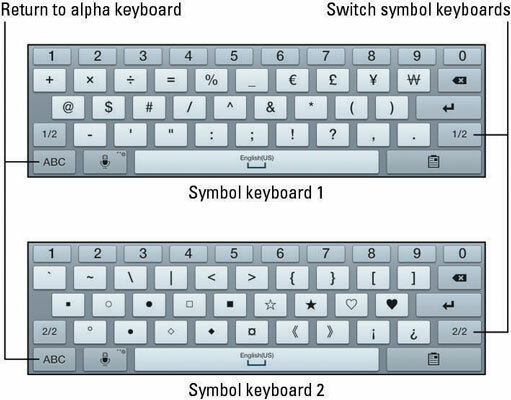 To return to the standard alpha keyboard, touch the ABC key. You can access special character keys from the main alphabetic keyboard, provided you know a secret: Long-press (touch and hold down) a key. When you do, you see a pop-up palette of additional characters, similar to the ones shown for the A key. Not every character sports a special pop-up palette.